In-line booths are set with 8′ high back drape and 3′ high side drape and have only one side open towards an aisle with at least one neighbor on each side. In-line linear booths are 10′ or 15′ wide x 10′ deep and generally arranged in a row. In-line corner booths are set with 8′ high back drape and 3′ high side drape and are exposed to aisles on two sides with an adjacent neighbor on only one side. The same height restrictions and signage rules apply for both in-line linear and in-line corner booths. A perimeter booth is an in-line booth that is located on the outermost aisles of the exhibit hall. Perimeter booths do not back up to another exhibit. The same height restrictions and signage rules apply to perimeter booths except that the maximum height allowed in the back half of the booth is fifteen (15) feet. Display materials may not obstruct or block sight lines of neighboring exhibits. No part of the display can exceed eight (8) feet in overall height. 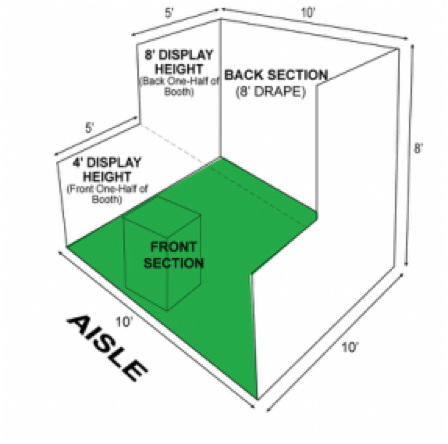 The maximum display height of eight (8) feet is permitted in the back half of the booth only. 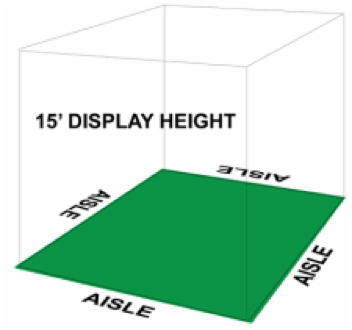 In the front half of the booth, no part of the display (including signs) may exceed four (4) feet in overall height. Signs are considered part of your booth display. Signs may not exceed the maximum height of eight (8) feet in the back half and four (4) feet in the front half of the booth. Signs may not be hung from the ceiling. Island booths are a minimum of 20’ x 20’ and exposed to aisles on all four sides with no adjacent booths. Island booths do not receive the standard pipe and drape. The entire cubic content of the space may be used to the maximum allowable height of fifteen (15) feet. Signs hung from the ceiling directly over the exhibit are permitted in island booths that are 400 square feet or larger. Please note that all signage suspended from the ceiling must be hung by the Show Director at the Exhibitor’s expense.